The Ultimate in Trapezoid Distortion on CTC177? Would You Buy One of These Sets? Back to RCA Solder FAQ Table of Contents. The procedures described in this document require access to potentially dangerous voltages, proximity to the CRT and its implosion risk, and other possible dangers lurking inside a television set. Furthermore, while your symptoms may fit those described below, there is no guarantee that resoldering the tuner module WILL fix your problem. The actual cause could be elsewhere. IMPORTANT NOTICE: If you find that your TV has symptoms matching those caused by bad solder connections as described in this document, or have had an RCA/GE/Proscan TV repaired for similar symptoms, or are just curious, there is a class action suit pending against Thomson Consumer Electronics which if approved, may entitle you to a cash rebate. The deadline is May 20, 2001. Problems with bad solder connections, mostly in and around the tuner are very common with several series of late model (e.g., CTC175-187 and higher chassis) RCA/GE/Proscan TVs. Ignoring these erratic and intermittent problems can lead to serious damage including failure of the EEPROM and possibly other expensive ICs. Therefore, it is essential to deal with the solder connections as soon as these symptoms appear. The repairs are straightforward though perhaps tedious. Thomson may reimburse for reasonable cost of repairs. Sometimes, similar symptoms are the result of bad solder connections elsewhere on these chassis. Check around the pins of large components like power transistors, power resistors, transformers, etc. However, since problems with the tuner soldering are so common, this is usually the place to start. Note that many other RCA chassis as well as other manufacturer's TVs are also susceptible to similar symptoms with similar causes. Random power cycling. It may come on in the middle of the night! Picture shifts or changes size vertically or horizontally. Picture turns to random display of time or other data. Remote has no or unexpected effect. I have no connection with Thomson Electronics or any other manufacturer of consumer electronics. These articles have been included unedited except for some spelling, grammar, and format cleanup. The CTC195/197/203 series with the onboard tuner has a batch of other problems, not the same type of failures that the CTC177 line was notorious. Most of which are addressed with service bulletins given the units serial number. However they are suffering from a conductive glue syndrome the Thomson engineers are still in denial about. It seems the glue they are using to attach the surface mount components is sometimes becoming conductive from the manufacturing process and will cause all kinds of really odd intermittent problems, most of which cannot be fixed unless you get lucky enough to see it several times while working on the set. Specifically c17503 and c17504 inside the tuner, and some down by the microcontroller are the most common culprits. The latest Thomson sets we have been seeing have a stand up tuner that runs off the I2C bus, but those are failing at an alarming rate. Seems they are using the same I2C prescaler IC by Philips that Zenith and Sony are using and also having high failure problems. If you generate too much static by sneezing near the cable line you can blow one of these ICs. For a cheap TV set if you can live with the poor focus, contrast, and poor convergence on most of the Thomson sets, they are comparable with everything else that is selling that cheaply. "I have a 26" RCA television with a "squeezed" vertical and "snowy" picture, at its worst times it also shuts off and on again. This problem is occurring 50% of the time, I noticed that tapping the panel where the 75ohm and rca connectors are attached will realign it temporarily. Is this a symptom of the "solder cracking I read about in RCA's or a bad EEPROM and if it is a bad EEPROM why does a smack offer a quick fix and why is it shutting off and on?" "This picture is short vertical about 1/2 inch at top and two inches at the bottom. Anyone seen this problem on this chassis. Is it possibly related to all the bad solder joints in the tuner area?" The audio will suddenly switch to maximum volume. The volume buttons on the TV and the remote control have no effect on the volume during this time. If the blaring condition occurs and I attempt to adjust the volume very low, then when the condition returns to normal, the volume comes back at this very low volume. So the signal to adjust the volume must be received by the controller while the speaker is blaring. If I use the remote to mute the volume a slight diminishing in the volume can be noticed, but the mute is not accomplished. If I cycle power, the problem persists, unless I leave the unit off for a while (sometimes 30 seconds, sometimes a few minutes) before turning it back on. If I adjust the volume to minimum and turn on the muting, just using my stereo for sound from the VCR, the TV will still begin to blare in short burst and then eventually come on and remain at full volume." "My parents' RCA TV has lost some volume, and is now barely audible when on full volume. The controls are all electronic and on screen. Is this a known problem with RCAs, and could there perhaps be a pot I could adjust inside to 'boost' the volume?" "I have a GE 31" (about 3 years old) where the picture moves down the tube, like a DC offset is present. The top of the picture is down about 1/3 from the top of the screen and the bottom of the picture compresses. Occasionally, the picture turns to snow. If I turn off the power and back on, it temporarily cures the problem. Could these symptoms also be caused by poor tuner connections?" "I have the SAME TV, and mine is about 1/5 off. Some channels also have lots of Snow etc." "I tried using a VCR as a tuner & running the signal in through the RCA plugs in the back. Same difference. I still experience the same problems. Does this rule out the turner?" The screen will suddenly go from showing a picture to show nothing but "snow". There is no sound, the remote control won't shut it off, the power button on the set won't shut it off, it has to be shut down by unplugging it. When it is plugged back in it will sometimes come back on without pushing the power button or using the remote, screen shows nothing but snow, no sound. Sometimes when it is plugged back in it works normally (won't come on until you push the power button or use the remote), it then acts normally except there is no sound until you use the remote or the buttons on the set to adjust the sound." "My RCA XL-100 TV has begun to develop a life of its own -- it intermittently goes crazy." "My two and a half year old GE 25" set started having troubles with the picture shrinking from top to bottom, losing signal strength (snow) and now shifting of the picture off the bottom of the screen. This would occur usually right after turning it on, and sometimes could be cured by turning off the set and turning it back on again. Lately it has been getting worse so I took it in for repair. Lo and behold, there were several GE and RCA sets there that had similar complaints. All ended up needing an "S-kit" from GE, an item apparently supplied to the repair center for free from GE. I needed a crystal as well. This sounds like some kind of widespread problem that maybe should be looked at as if it is an unwritten warranty? Anyone care to comment?" "I have a 27" GE Model 27GT610. About a year ago a problem started to develop. It would take turning it on 2-3 times before the picture came up. Initially all I would get was a black screen and static on the speakers as if it wasn't on a broadcast channel. Over the last year it has progressed to taking me 20-30 minutes to get the picture to come on. I suspect it might be a corroding startup relay but am unsure. Does anyone have a part# and component# that could point me in the right direction? Any other suggestions would also be appreciated. Thanks, btw I already have the FAQ. When the set is turned on, the "reception" on some cable channels is terrible, but others are fine. Turning off and on again fixes those channels, but within a few seconds, the reception goes bad again. There is a time display function and a mute function on the TV. When I press a button, the channel displays in the upper right corner. Likewise in the lower left corner with mute. When the TV is misbehaving, these words "walk" down on the set. The MUTE word goes so far that it's unreadable since only the tops of the letters show. Turning off and then back on temporarily solves the problem. Whenever this phenomenon occurs, the top of the picture gets "squashed" down and a black band appears at the top of the screen. When I look at CNN, the sportsticker at the bottom is almost unreadable and it appears that the lower part of the picture is forced into the non-viewable area of the screen. If I struggle through these problems for an hour or so, then everything is almost back to normal, but the problems do appear intermittently. When I switch over to the VCR tuner, my reception problems are solved, but I still get the screen "walking" behavior, so it looks to be more that the tuner chip (unless that also controls these extra functions). Does anybody know about this problem??? Is it just a bad chip or component that I can replace? What should I do about it? (I'm a EE and am quite capable of fixing simple soldering problems and such myself). Before I take it to a repair shop or buy a new one, I'd like to see if I can fix this one... in a word... HELP!" "I have an RCA FMR70ER TV that only works when the room temperature is warm. If the temperature is cool the TV will never turn on . "The problem tends to show up after the TV has been on for a few minutes. The picture will appear to have signal problems (i.e. a snowy picture), and then the top line of the picture will begin to dip down, until it is approximately 25% of the way down the tube. There is just black above it. When its really bad, the picture will be just snow, the top will drop down almost half, and there will be a very bright band at the bottom of the screen. Now, one way to remedy this problem is to shut the TV off, and then back on again. Sometimes this will 'reboot' the TV and the picture is fine. Sometimes it doesn't work. The problem is beginning to become more persistent and annoying!" "I have a General Electric 21" (or 23"...can't remember) colour remote control television. It's about two and a half years old. The problem we're having is that the picture is 'dropping' off the bottom of the screen. This sometimes happens shortly after turning the TV on, or sometimes not for some time after turning the TV on. What happens is that the whole picture seems to move down a bit on the screen, then it moves a little further, then before you know it, there's about a couple of inches of black at the top of the screen, above the picture. You can't see the bottom of the picture because it is now below the bottom of the screen (i.e. the picture doesn't just shrink). Sometimes a bright white line will appear at the very bottom of the screen, and after a snapping sound the picture will jump back up (sometimes back to the top, sometimes just part of the way up). Then it happens all over again, kind of random. If you turn the TV off, wait a few seconds, then turn it back on, most of the time (not always) the picture will start out back at the top of the screen as it should." "2 year old GE has tuner problem. Some channels part snowy others very snowy. Sometimes don't work at all. But, only on some channels. ( Vertical is not shrinking). Any case histories?" "I have a CTC177 that instead of the two relay clicks of the degaussing circuit will click 6-8 times when it is first turned on. Signal was coming from U3101 - changed IC, no change in problem. Works fine once it's warmed up, anyone else have this problem?" "I have a weird problem, or at least I have never seen it before. I have a GE colour television that when it is initially turned on the lower channels are not existent (snowy) and the upper channels are crystal clear. When the TV has been on for about half an hour, all the channels are crystal clear." Cable box hooked - no picture on any channel. Straight cable to TV - only cable channels 54, 55, 64, & 76 (nice and clear). Should i go ahead and resolder the tuner connections and see what happens or does it sound like the microprocessor may be out?" "I have a GE TV 25GT543, CTC187AA chassis with a vertical intermittent where a whack on the side fixes it. Is this 'the resolder under and around the tuner' fix? Is there anyway to tell exactly which connection is really the bad one rather than randomly resoldering everything within sight? I like the feeling I get when I know that I have really found the source of the problem rather hope I got it....."
"Volume and channel OSD shifted off to the right so that channels are not visible. Closed captioning and customer menus shifted to the left. Tuner shield was done about a year ago and is ok. Problem occurred after a power surge that caused C7 the main filter capacitor to fail. Otherwise the set seems to work fine. Horizontal and vertical sync pulses are present on pins 26 and 27 of the micro." Someone brought me a TV to look at. After a little prodding, it was learned that he had lent it to a friend and it died after six months or so. The 'friend' then attempted to replace the tuner module based on the description on a refused estimate from a TV service shop. He did not have proper soldering equipment - perhaps only a Weller 100 W soldering gun. Needless to say, the TV did not work - nearly every pad on the PC board under the tuner had been destroyed. I had to run wires from the pins on the tuner to the their destinations on the mainboard. It was not fun. Luckly, no permanent damage was done but it could have easily been a lot worse. I've also heard of at least one case where rather than resolding all the ground connections as described below, a much simpler repair was made by just adding a thick short jumper wire from the metal shield to a ground on the PCB or existing ground wire soldered to the PCB. This probably isn't quite as effective as the proper repair may be a reasonable alternative to try if your soldering skills aren't very well polished. However, I don't know whether this will work on all chassis versions. The specific example was for a CTC187. The solder RCA recommends doesn't flow properly. The only returns I've had after doing this repair have been because of using their solder. The best way to do the job is to use regular 60-40 lead tin and apply the right amount of heat with a controlled heat solder gun. Too much heat and you peal the board, not enough and it won't stick or will crack again. I first flux the joint's with rosin solder paste. I clean my tip before starting, and a couple of times during the job. Again, I use a controlled heat solder gun. This seems like a simple job because it is 'simply' soldering. Don't be fooled. I've been at this business for twenty years and am an expert at soldering. Of the first dozen or so of these sets that I worked on, I had a couple of solder spills that cost me a couple of extra hours to locate because I didn't realize I had made a spill and assumed another problem. Another hazard is that if you are not skilled and attentive, you may loose one of the small resistors or capacitors from the board. If you find it, then you've got to figure out where to put it back. :> If you flex this board you may cause a crack on a resistor or capacitor lead that could be very difficult to find. If you are a trained technician and do soldering regularly and have a controlled heat gun, and are used to working with these flimsy consumer type circuit boards, then you can probably do it with no problem. There are some jobs that are suited for do-it-yourselfers and I don't hesitate to tell a guy if I think he can do it and save a few bucks. This is not a job I would recommend for the average guy to tackle. I can think of very few solder job's I've ever done that require more skill and attention than this one. Sorry, I'm sure that's not what you wanted to hear. However, next time you have a problem, just ask. I may have an easy fix for you, and will be glad to give it if I do. Following the instructions packed with the service bulletin will allow a proper job to be performed. Overheating the board substrate and surrounding components will cause future and horrible failures. The connection will NOT look shiny but shouldn't look bubbly or crinked, the solder will only flow if you use the special solder paste, rosin core solder will cause it to corrode oddly so clean all rosin core off the board. A standard Weller station does the job quite well and experience has shown me that the full repair with jumpers and the special solder (as the bulletin states) is the best thing to do for reliability and customer satisfaction. I was mistaken in earlier ramblings. This sounds like the typical shield/pcb solder joint problems that RCA has had made famous with their CTC175/177 chassis. It's a common problem. We have fixed literally "tons" of them. I'm guessing it would be this series of chassis because you also mentioned the EEPROM. The symptoms you mentioned are all associated with these bad solder connections and there are even more symptoms that can appear from this same problem. No video, color drop, etc. are other common symptoms. Just get your solder iron hot and do a good job soldering ALL bad connections related to the shield areas and you'll be in business again. You'll still just have a "new model" RCA, but, the symptoms you describe should go away. If you catch it while it is in the "smack" condition, you shouldn't need any parts. If you wait until it dies completely, you could be looking at an IC or EEPROM replacement. You DON'T want to replace the EEPROM, trust me! The problem is bad solder connections under the tuner shield. The bad connections cause false signals to the EEPROM which cause the reduced vertical height. RCA just recently has issued a bulletin and a kit to repair the connections with a special "elastic" solder which isn't supposed to crack under temperature fluctuations. I would open the tuner control module and solder all the posts that are around the periphery of the board. Also on rare occasions, the solder connections break on the main board jack that the plug from the tuner control module attaches to. Resolder them also. Good luck. I am sure you are probably talking about the "infamous" Thomson (the RCA/GE owners) bad solder joint chassis'. They started with the CTC175/176/177 and from what I see they have continued on up through the CTC187 at least and maybe further. You can confirm your chassis number by checking inside the back of the set or on the back of the set sometimes. These sets have a variety of symptoms accompanying the bad solder joints. The two you listed are only a couple. When repairing these sets, all of the trouble areas should be repaired at that time. You will be just asking for more problems if you don't. If you are very technically minded, you may be able to repair this yourself. If not, you could try a local repair shop. I have heard repair prices for this range from $50.00 to $140.00. I don't have any idea what the shops are doing to repair them for $50.00, but, I suspect they may be just going in and soldering the obvious bad joint, at the time. As I mentioned, this would only be a temporary repair at best. 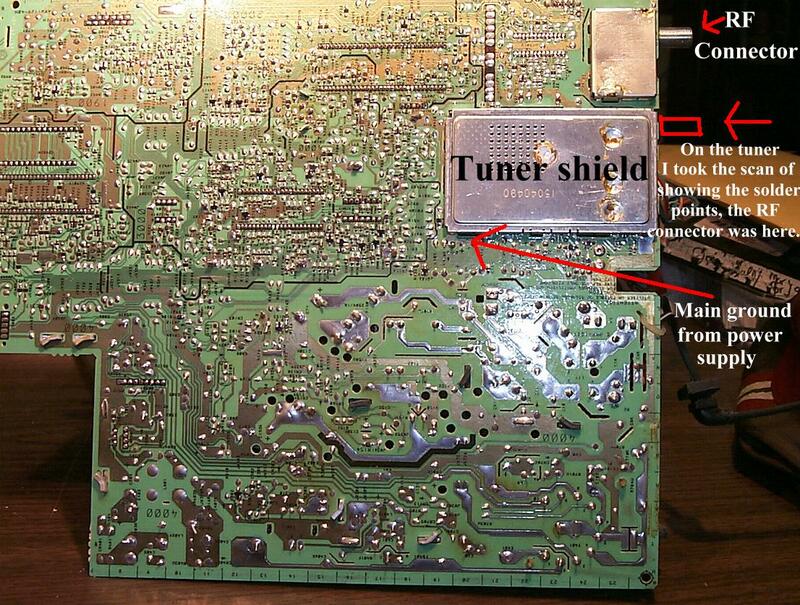 The majority of the problems are under the shield of the "built into the board tuner", but, there are others also. I know our charge to repair them, complete, runs about $100.00. (lots of soldering to do the job right.) If you decide you need further info, post what model and chassis number you are working on. If it is the problem that I think it is, I can tell you, from our complete repairs, we have never had a recall on these chassis for this same trouble and we have literally repaired tons of these things. In RCA/GE chassis CTC-175,176,177, There is a common problem with bad solder on the tuner shields and around the microprocessor shield. The symptom is usually intermittant snowy picture and reduced vertical height. Please do not be misled into trying to troubleshoot the vertical section as you may be wasting your time. Often you can confirm if this is your problem by grabbing the RF input connector firmly and wiggling it while observing the picture. Thomson seemed to have solved the problem around the end of 1993. I have done lots of these. It is the CTC series chassis and the tuner solder joints break. You should take the set in as soon as the problem develops to avoid permanantly damaging the set. The S-kit is most likely the repair kit for the GE series (S stands for solder) it has special flexible solder that will keep the tuner from going again. Yea! These RCA/GE all are having the problem of loose grounds. They are mostly around the Micro and Tuner grounds. If your having problems with the picture becoming snowy you may have to remove the tuner shield and do those also. The intermitten power on and off may also be around T4401 Flyback Transformer. Check or resolder this area also. I'm not familiar with this model in particular but the symptoms you describe my be similar to another well documented RCA tuner problem. That problem involves tv's of about the same vintage and after a year or so develop symptoms similar to what you describe. The solution to those maladies is resoldering all of the tuner shield connections where the shield connects to the pc board. I have accomplished the "fix" on several RCA TVs of that vintage with similar tuner symptoms and in each instance was able to completely correct the problems and restore the tv to workable condition. It is not a picture tube. Why is it that some people think that the picture tube is bad when the set has a snowy picture? It's solder connection in the tuner, the tuner is not replaceable it is part of the mother board. Call RCA and ask them if they will foot the bill. If not call an authorized repair center and get an estimate. Get the problem fixed now or the connections will cause enough noise on the microprocessor that it will eventually 'deprogram' the EEPROM and you'll need that replaced and it's quite expensive as this part holds *all* adjustments. There are only 2 or 3 controls that are manually aligned. I have fixed many, many TV's with this problem. It is common to all RCA, GE, LXI model. The problem is easy to fix, but its hard to get the area ready for repair. To those that are brave remove the back, pull out the chassis, (some plugs must be removed so mark as needed) turn the mother board over. Now find the metal can near the cable connection. Their will be 4 solder connections, remove (its harder than it look) then remove shield to expose inner tuner area. You will need to solder all ground inside and around the shield mound you removed, and the connection that was unsoldered from the shield. Now solder any connections that looks bad including surface mounded components i.e. : transistors, IC, and the cable input connections. reassemble in reverse order then your problem will be gone. Be careful not to bridge any connections that is NOT connected a good mag light is a must! I normally charge $70 labor for this job takes about an hour of work and 8 hours of playing time to confirm the problem is fixed. Only one out of 20-30 TV's required parts. On the CTC175 family of chassis, the tuner shield soldering job must be performed before any other troubleshooting can be done as this procedure will correct many such symptoms. the tuner shield on the bottom of the board must be removed and resoldering around the shield structure should be done. There are four posts that need to be resoldered, and check for any other suspicious looking connections. There are other circuits to check also. Give the entire board a good look. When that is done, see if there is any change in your symptom. These chassis also have a service menu that can accessed by pressing and holding the menu button then momentarily pressing the power and volume up buttons. CAUTION!!! If you are not familiar with these procedure DO NOT MESS WITH IT!!! You can really foul up your set. This procedure is included in the service manual. I advise resoldering the chassis, all ground and shield lugs that feed through the board, especially around and under the tuner shield. If you can't do this take it to a shop and tell them the symptom and that it needs resoldering, if they don't know what you are talking about take it somewhere else. If you wait to long the problem will get worse and will damage IC U3201, the EEPROM IC, which means a complete alignment of this IC. Most techs will fudge these settings and may be ok but don't wait till that occurs for your own benefit. Yup!! Actually, the whole tuner shield/microprocessor shield grounds all are poorly soldered. You can sometimes with the naked eye or magnifier see some of the loose connections, but if you solder just a few now you will be back in there in a month or less guaranteed. So just do the whole solder job. It is actually a much better repair and you can rest easier at night knowing that you resolved the problem rather than patching it. The 'classic' problem is prone to the CTC175 through CTC187 chassis. I'm also seeing the same problem on the newer generation CTC178 through CTC189 chassis. Instead of RCA redesigning their 'On-Board' tuners, they would rather re-design the solder thats been around for hundred years give or take. Good Luck!!! After thousands of on-board tuner repairs. I have started to get recalls (couple of years old) and finding that sets suffered from grounding problems around the tuner, Again!! After re-doing the grounds once more, recalls within weeks, sometimes DAYS. Apparently, the foil is breaking loose from the board around the tuner. Solution: Scrape all the points mentioned in the RCA tuner modification (except the goofy solder), and then re-solder once more. But do not overladen the the joint with too much solder. Then it lasts a couple years at least. RCA CTC175A Tuner Solder Locations shows the problem areas for this chassis. I have highlighted in red the ground points that were actually broken on that set, and in yellow the ones that were either suspicious or appeared OK. The section of the panel which is connected to the power supply's ground, (labeled "main ground") seems to be the most likely to break of them all, and wreaks the greatest havoc. I keep a print of this on my bench (stapled to a few pages from the Sci.Electronics.Repair FAQ Web site!) and refer to it whenever I do a complete resolder of one of these shields. Photos of another CTC175 showing parts location can be seen at CTC175 Mainboard - Top View and CTC175 Mainboard - Bottom View. I don't know how similar other chassis are but the photos may be helpful in any case. I have oriented RCA CTC175A Tuner Solder Locations photo to be the same as the diagram below. I assume the inconsistency in aspect ratio is just due to the ASCII art! First under a bright light, after removing the bottom shield look for solder splashs or components that may have been desoldered by heat. |_________________________________|< corner causes vertical bounce. Two X's will cause a snowy pix, they are posts from the shield that are supposed to poke through the bottom but don't quite make it. A small round pad that may look like a test pad or that has a component lead poking through the board are good points to solder. Also when you remove the board in some sets the leads on a filter to the left of the deflection/color/etc. IC can be bent and short, usually resulting in a snowy pix or just snow. (View from bottom, IC is below tuner, filter is to left, has three in-line pins. See RCA Service Bulletin for the original instructions, which may be easier to understand. I made up this CTC175 Tuner Solder Locations diagram to help understand what was under the tuner cover and where to solder. On all of these RCA chassis, with the 'sandwich' type tuners, the shield must be removed, and then carefully solder everything you can see on the top and bottom of the tuner. Then re-install shields and solder them in as many places as you can as well. A special solder (very very expensive) is sold to the repair centers, that has an elasticity to it to allow a correct fix for this problem. However, you can get away with just normal soldering in most cases, to cure the problems. The connections that are bad, are feed-through holes as well as all connections around the perimeter of the tuner can. Each feed-through can be spotted and rca supplies you with a mask. There are about 15-20 connections in all. RCA has a fix for this, which uses a very special ($700 a pound) solder which has elasticity to it. That and the solder mask helps to make a fast repair. Also look about for ends of any chip components that were poorly soldered. Got to have a fine point tip, or your likely to short something out in your effort to repair. Be advised that there are many surface mount transistors, chip caps, and resistors that are in the tuner, so you will need a fine point low wattage or temperature controlled soldering iron for these. You don't really need a template! Just solder the shield all the way around, and at each point where it comes through the chassis. (this is easily observed by removing the top shield cover as well). and instead of adding jumpers, I simply solder each corner of the bottom shield to the pc board. Jumpers work just as well, so if you want to follow the instructions of the people who didn't make it right in the first place, be my guest. A close inspection will also reveal the locations to solder. And resolder the upc shield too! Disconnect the power, remove the back of the set. You'll see the circuit board in held in a smaller plastic sub chassis/tray. flip the set so that the picture tube is face down on the table. Remove the 2 screws that hold the tray. You can now flip it back up but be careful after removing the tray that the set doesn't fall backwards and break the picture tube neck. the circuit board slid into the tray from the front. Take off the hex nut on the antenna input, look at the video and audio input RCA connectors next to the antenna you'll see a bracket held in place with a removed plastic rivet. push it out from the rear and remove it. Look at the power cord where it connects to the tray, you'll see a plastic tie strap cut that. There may or may not be one screw towards the front of the tray that holds the circuit board in the tray, if so remove it also. The circuit board should now be free to slide out of the tray. Now that the board is free turn it over and you'll see the bottom of the tuner. It's a metal cover about 2.5" by 3" You'll have to unsolder 4 solder points on the tunner cover. Do this with care, you may need an 80Watt or better iron to do this. Once done you can Very, Very Carefully pry the tunner cover off. Take Care not to damage any Components/ Circuit Traces on the board. Now you can solder all the grounds to the tuner shield and the four pin that the cover is soldered to. Use care, don't overheat the small SMT capacitor, resistor and diodes. It's not a hard repair if your careful. "I need some help with this GE tv. Its a 1993 vintage model 27GT613 with a chassis number of CTC177BH." I resoldered the tuner shield and connections. However, when I powered it to check to see if I had resolved the intermittent tuner situation I found that I receive stations 2-13 with much snow in the picture." If you are sure that you did not make a mistake in soldering, check the RF coils. The coils are small wires through the PC board in the tuner section. I have seen a few cases where the wire was probably not clean when soldered. You may have to scrape each wire and solder it again. A bad MIXER coil may cause snow on some channels and be ok on others. EEPROM alignment will not solve the problem. Almost any problem can be due to a bad EEPROM since it contains the 'boot' information needed to set up all the TV's subsystems. These include reception, raster, picture, menu, closed captioning, color, sound, and other symptoms The most common cause are the bad tuner solder connections discussed elsewhere in this document. However, EEPROMs can and do fail on their own. "Try running the color adjustment *down* all the way and keep holding the button down until pointer stops moving. If the EEPROM has damaged data, running ALL the adjustments up and down at their extremes may restore them. If this solves it, have the tuner serviced by a Thomson service center to keep the data from being scrambled again (or perform the soldering as described elsewhere in this document --- Sam). A carry in job for just the tuner service w\update kit should be approx $100 depending on market." Picture is as wide as the screen but the vertical height is compressed. Picture starts about 1/3 of the way down the tube and extends to about 1/3 of the way up from the bottom. Furthermore, the bottom traces seem to be overlayed resulting in brighter than normal lines." This is a common problem for all GE, RCA, ProScan televisions of a variety of chassis. It is due to a design and manufacturing flaw. You should call RCA Customer Relations at 317-587-4151 and take it to a Thomson Authorized Service Center. (Thomson Electronics of France owns the names, RCA, GE, and ProScan for Televisions. ) Thomson has been sending their customers $75.00 for carry in service and $95.00 for in-home service. This amount should cover the bill as any technician who knows what they are doing should be able to complete the repairs quickly. There is a small chance that the data in the EEPROM IC that stores all the setup data has become corrupted. In this case the set needs to be reprogrammed to operate correctly. This is a time consuming process and can have a great affect on the quality of reception. "I have a dead RCA CTC175 chassis in my shop that I have traced down to a bad EEPROM. The tuner shield solder connections were repaired, but how do I read the EEPROM contents when the set can't be fired up? We have done a number of these EEPROM change outs, but never with a dead set." If you do have troubleshooting experience, scope pins 5 and 6 of U3201 when the set is first plugged in to see if data is being exchanged momentarily. if the data continues on and on, then the eeprom is bad. If data occurs for just a moment then settles into a steady 4.8V, then troubleshoot the horizontal drive circuitry, and if there is no data and no 5V on pin 8, then troubleshoot U4101 and the 1.5meg resistor off pin 4 (I think) for open. As Hank pointed out, you could have a blown fuse and shorted flyback although they are unlikely on this chassis. If you do have a blown fuse, U4101 is most likely shorted and the 140V rectifier is probably shorted too (CR4106 I think is the location). The flyback, while possible, is the last thing I would try. You are right, it is probably the EEPROM. When you install the new one, the set should fire up, but the horizontal sync will likely be out. Just enter the service menu, and reprogram the eeprom. There are about 80 parameters that need to be set. To verify that it IS the EEPROM, scope the data line on the EEPROM, and plug the set in. If you see a burst of data, and then nothing then the EEPROM is OK. If you see continual data, then the EEPROM is bad, as the CPU is trying to find it, and the eeprom is not responding. If no burst of data, then check your power supply. Everything from soup to nuts can be blamed on that blasted EEPROM. No audio, no vertical, no color. All bad eeprom. I have changed hundreds, and have 3 sets in my shop now waiting for their turn to my bench. I keep one known good EEPROM to use as a test. It just takes a few minutes to sub it. It doesn't matter what chassis the EEPROM is from when you are using it for test purposes. You can remove it and order the correct one if the set starts with the sub or if your symptom disappears with the sub. About the only thing you might have to do with it is to set the horizontal frequency for various models but you can get a pretty good idea whether or not the original is the problem. For the RCA series CTC chassis that have been produced in say the past 6 or 7 years, there is a 4 pin IC near the front of the chassis..... that is the EEPROM. Every chassis has letters such as CTC175 A or K or E2 etc. When you call for this part you need to know the exact letters of the chassis, because the programming in the eeprom differs for every chassis. I have a complete list ng of all eeproms to chassis part numbers. The info on the ic is useless. The majority of the EEPROMs run about $4 to 6 which is not all that much. We stock all RCA EEPROMs. How do you know when your RCA needs a new EEPROM? The two most common reasons are: no power (TV will not turn on) or no audio. Yes, sometimes the TA audio chip goes bad, or the fat flameproof resistor that feeds the main voltage to that IC burns up, or solder loosens from the board. When you determine you need a new EEPROM, and you put it in, audio should come back. But if it does not and you know the audio IC is good, chances are you may have zapped the IC or the new one is defective. These EEPROMs are extremely sensitive. To determine if it is the EEPROM, you need to desolder a pin on the main IC and apply a 4.6 volt source to it to see if it will bring audio back. I don't have the schematic handy so I cannot tell you which pin that it is but that is a definite way to determine a bad ic due to an EEPROM. Once you replace the EEPROM, you need to reprogram the set. off of the main menu you have to put the TV into service mode. If you were smart (and the TV was not in shutdown) you copied all the codes from the old EEPROM, so you know the settings for the new one. Knowing these codes is extremely important! There are something like 50 main options 100 more just for the tuner set-up. Get the service manual! MAT Electronics. Go to "Catalog", then "EEPROMs". Listed by chassis number. The factory identification section is where the generic microprocessor gets the data on what chassis it is in. If this get's scrambled the set might think it's a PTV or other size set or has a different type of audio system, etc. This is only alterable by a device that can directly write to the EEPROM and cannot be modified by the TV (except when something goes wrong) or the technician without knowing the data and having and I2C EEPROM programmer. The factory adjustment section is that part that stores technician alterable settings such as horizontal hold, stereo alignments, etc. and can be adjusted by entering a code and then using the remote or chipper checker from Thomson. The Customer adjustment section holds all customer controls and is adjustable in normal use of the set. Since this chip is an I2C bus memory chip it should be quit easy to buy one of each chip from RCA and pull out the chassis coding for each chip then buy the IC in bulk at 1.00 a pop. It's an interesting chip anyway and worth experimenting on. I think Phillips has such a programmer available since I2C is there baby. BTW, you should get the FULL 'service' model number and FULL chassis number when ordering parts. Having the service model number makes it easy to look up the full chassis number, you only need the full chassis number to actually get the EEPROM but some parts require the 'service' model number. The service model number is the model number in smaller print on the back that has 3 or more extra digits on the end. Now it's pretty clear, if the very first bit of your EEPROM gets cleared, the sound is gone. So, before you touch anything else, try writing 0x0F to address 0x00. If you're familiar with I2C, you know, address zero (and subsequent addresses if you're really unlucky) can be cleared easily by accident if one keeps the data (SDA) low and bangs the clock (SCL) long enough. On early sets, crazy things like that happen when the micro loses ground due to an intermittent tuner shield contact. Newer sets have the micro grounded thru other paths; nevertheless, EEPROM corruption is not completely eliminated. 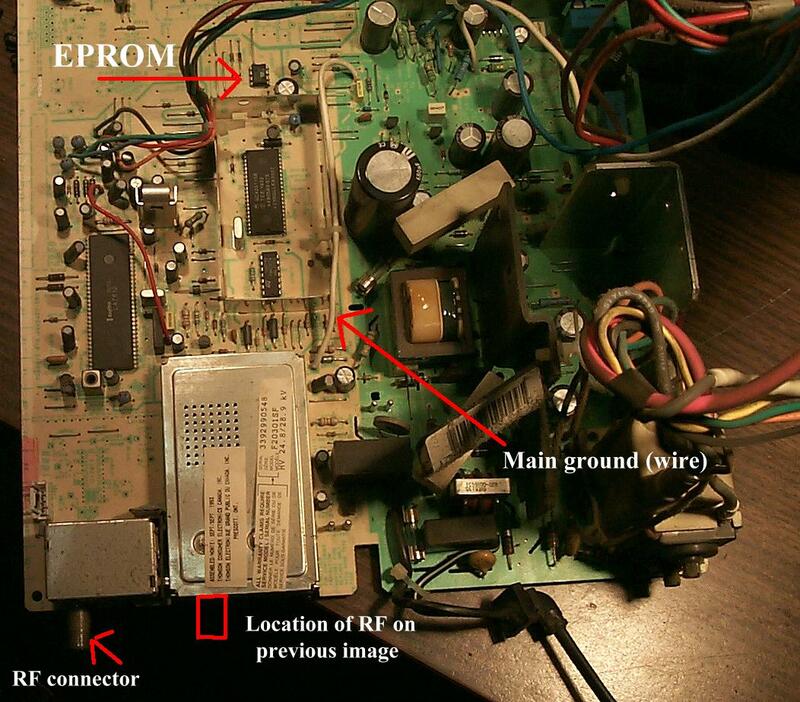 The EEPROM map varies, even for the same chassis due to revisions. EEPROMs are *not* interchangeable! A factory new EEPROM does *not* have any correct alignment values: it's only good enough to start up! No TV made by Thomson(GE/RCA/ProScan) has ever had a non-volatile memory built into the microcontroller. Some sets have more than one EEPROM. Some ancient AccuScan boat anchors have the channel list in the *remote* and not the *TV* set. Once I had the pleasure of aligning a couple of hundred chassis in a couple of days; The defaults were grossly incorrect for tuner settings; failing minimum gain, tilt and out-of-band rejection specs. Some channels wouldn't come in at all, and a few sets wouldn't sync up. If you don't understand how the micro works and what's in the EEPROM, it's all black magic and you'll be cussing and replacing chips at random. If you know the game, you can fix a number of things without ever having to solder or buy a component! Various configurations require various EEPROMs. Stereo/Mono, AV jacks/no AV jacks, PIP/no PIP, linear power supply/switch mode power supply, pincushion circuitry/no pincushion circuitry, hotel set/consumer set, and the screen size are all variables stored in the section of the EEPROM not accessible from the on screen menu. There also at least 2 different microprocessors. The early sets were produced without closed captioning and require a different micro. I agree that there is a lot of confusion caused by the variety of EEPROMS and the lack of properly trained techs to service these sets. I have seen quite a few butcher jobs to the tuner shields, wrong EEPROMs installed, and incorrect or no realignment of the EEPROM values. Unfortunately there are many people who think they are qualified to service these units just because they claim to know how to solder. When in doubt about the correct EEPROM check with the local RCA parts distributor with a chassis number or better yet buy a manual. There are dozens of different models, each with different functions supported by "instructions" in that EEPROM. You could buy one of each (chip) and clone them with a burner, but unless you have hundreds of sets to repair, it wouldn't make sense to go to all that trouble. There are now quite a few after-market sources for those EEPROMS. The specific one for the chassis you're working on must be installed or the set will not work properly. Some of the 'programming' of the chip must done *after* it is installed, by the tech, such as the tuner setup adjustments. Each tuner is of course different and so requires tuning. Other factory-programmed EEPROM data cannot be changed by the tech during setup... that's the basic reason the EEPROM must be replaced when the tuner grounds corrupt the data. Rather than start from scratch each time the chip must be changed, the tuner settings can be 'copied' from the old chip (Note: not always possible), i.e. readings written down on paper and then entered into the new chip during the setup adjustments. After you've done the tuner resoldering, install a socket for the EEPROM. Unplug the TV, install the replacement chip and power up the set. With the set still plugged in (but turned off, of course), remove the chip and install the "bad" one and copy the "parameters". Put the replacement back in and enter the values you copied down. The set should now work properly. I've been able to do that on all but one set I've worked on. You will not find that information in the RCA service literature. It's essentially a workaround, dreamed up by a tech to save time. Bless that one! "I have a GE 27 inch stereo TV (model 27GT613, chassis CTC177BH) on which I just repaired the tuner shield cracked solder connections." A friend of mine who repairs machines said it was the EEPROM before he even scrolled done to see that you had had a repair tech look at it. He also has told me that to replace the eeprom you need to get the correct eeprom from RCA and prior to removal all of the factory settings need to be recorded from service menu(he doesn't remember exactly how to get to it without a tv in front of him--check a sam's photofact for details--you can also get the correct part number from that too. Do not trust Sam's photofact for the correct part number. There are about 14 different part numbers for CTC177. They may all use the 24C02 but the default values are different. Hey, NAP uses a 24C01 and they charge about $25 for it. Has anyone built the I2C programmer yet? Your problem could be caused by a bad EEPROM. First you need to get the correct replacement EEPROM. The letters at the chassis will get you the correct part number, i.e. CTC177XX. Before you remove the old EEPROM enter the software service mode and copy down all the settings so you can write them into the new EEPROM. I would suggest using a socket also. The July 1997 issue of "Electronic Servicing & Technology" magazine has an article "Servicing EEPROM problems in RCA televisions", by Bob Rose. (Editor: Nils Conrad Persson (CPersedit@aol.com), Sales: Electronic Servicing & Technology, 76 N. Broadway, Hicksville, NY 11801, 1-516-681-2922. Editorial office: PO BOX 12487, Overland Park, KS 66212 1-913-492-4857. ES&T has also had articles on CTC17x servicing and of course all sorts of other repair of consumer electronics in general. While not something you will find on the newsstand, you might be able to get a peak at one if you snuggle up to your local electronics repair shop :-). The article is good with some useful information. There is a chart with average values to use for setup/alignment of the new EEPROM. Compared the printed numbers to what I wrote down from RCA CTC175A that was repaired by replacing the EEPROM using a socket and switching the old for new EEPROM after turning on the set to read the old parameters. Then setting the new ic to match. His numbers are close, so maybe TV would work about the same, just set new EEPROM to the average values in the chart. Disconnect AC from chassis by unplugging the set. Unsolder pin 8 of EEPROM (and isolate from pad). Use a pick to short pin 8 to the pad, temporarily restoring B+. Plug in set and turn it on. Remove the pick and therefore the short circuit (to the pad). Use the menu function to select speaker on-off. Reinsert pick to restore B+. Unplug set and resolder pin 8. I haven't tried it but sounds interesting. Wonder if some other EEPROM problems can be cured that way? ;-). You may have restored the EEPROM, it's worked for me with some very weird problems with the eeprom where I'd normally have replaced the eeprom. Note: You need the FULL chassis number and failing that the FULL model number to get the correct eeprom. The generic number on the eeprom will only get you an un-factory programmed eeprom that will not work or work *very* strange. The full model is the 'Service Model' in small print near the large print model number. There are several digits after it that point to the correct chassis number and thus the correct eeprom number. In many cases, while the contents of the EEPROM have been corrupted by write errors caused by bad solder connections, the actual chip is undamaged and really does not need to be replaced. The following isn't something you could likely justify for one repair but if you have a motel full of RCAs, it could easily pay for itself and then some in saved time and money! Note: I have not tested this software/device so I do not have any first hand knowledge of its performance. The hardware interface schematic is free from the Web site or you can buy it preassembled. Thomson's proper repair per their tech-tips is to reinitialize the EEPROM using the chipper check interface and software via computer. It only takes 5 minutes to reinitialize the EEPROM. It also gives the option of storing both the main EEPROM and the pip tuner EEPROM data values to disk for future writing to a new eeprom on the set being worked on. The 175/6/7 (and more) chassis has a SPEAKER MUTE feature for those chassis that sport speaker output jacks, and the speaker mute is also used during the POWER ON or POWER OFF functions. Even if your model doesn't have the jacks - the software and hardware to mute the speakers exists! When the EEPROM data is being corrupted by the poor solder connections - one piece of data that can become corrupted is the bit that is set to turn the SPEAKER MUTE circuit on. Since the on screen display for that model has no menu feature to allow the customer (or technician) to turn the speakers back on - you cannot correct the data in the EEPROM without an EEPROM programmer. There are some servicers that are using EEPROM programmers to access the data. A easy and cost effective work around is to disable the speaker mute circuit in hardware. This involves the removal of a diode or a surface mounted device (SMD) transistor - what part to remove depends of the chassis involved. If Q903 is present on the foil side of the board - remove it. If Q903 is not there, then CR1953, a diode, will be present on the component side of the board and it should be removed. Only one component, not both, will be in a given TV. Removal of whichever of these 2 is present will disable the speaker mute circuit. If the rest of the EEPROM data is OK or can be corrected by the on screen menu then this procedure will save the replacement cost of the EEPROM (less than $5.00 wholesale) and the tedious job of performing about 100 alignments to the tuning system which is *REQUIRED* after EEPROM replacement. On the negative side: The customer will find a difference in the way the TV operates! The software in the TV mutes the speakers during POWER ON or POWER OFF functions. This make both of those functions very quite. With the speaker mute circuit disabled there will be a small burst of noise during both of those functions. The level of the noise is not objectionable - but it will be a cause of concern for customers that are not forwarned. I would guess that over 80% of our customers choose the modification and subsequent cost savings rather than have the EEPROM replaced. If mono, cut or remove CR1953. (From: Sam). However, see below. There could be potential problems down the road with these half baked solutions: (From: David (dakuhajda@aol.com).) We have replaced many blown speakers in these sets that someone else had removed or shorted that same transistor. The mute at turn on and turn off is critical to the long life of the speaker. Hopefully you saved the old chip. If so, you can use it to put the original values back for the tuner (assuming a snowy picture was not one of the original problems). There are no "ball park" values. Install a socket for the EEPROM. Fire up the set with the new chip, then power it down. Without unplugging it from the AC outlet, remove the new chip and put the old one back in. Turn on the set and run the menu and copy down *all* the parameters for the tuner. Turn the set off again and install the new chip. Put in the values you copied down and exit. Power down and unplug the set for a few minutes. Now, fire it up again and see if it works. You may have to reset some of the operational parameters like height and RGB values, but the tuner should be OK. I've used this technique several times with very good results. It saves having to start from scratch. The trick is that some of the values in the EEPROM are sent to the micro when the set is plugged in, and others when the set is turned on. That's the reason you don't unplug it to swap chips. It's a bit of a gamble with the new chip, but worth it for the time it saves. Good luck. Remove the "bad" chip and solder an 8 pin dip socket in its place. Now take the new chip, plug it in the socket, plug in the set and turn it on. If all goes well and the set comes on (make sure you have already had all the solder connections repaired in the tuner before this of course) turn the set off and Without unplugging the set! Remove the new EEPROM and replace the original in its place. Turn the set on and enter the programming menu and proceed to copy down the contents of each of the memory registers. Do all of the tuning channels regardless of how many stations you are receiving. After you have completed, you can now replace the bad eeprom with the new one and program each of the registers. When finished, I then turn the TV off, unplug it wait a few seconds, plug it back in and make sure everything held. Sometimes I have to redo the horizontal hold and RGB registers. Get an 8 pin socket and remove the new IC and reinstall the old IC in the socket (I'm hoping it's not zapped). Plug set in and turn on. Enter the access code to get the numbers out of the old EEPROM and copy them down (all entries - even channels you aren't using --- sam). Put new IC in socket and copy in the numbers you wrote down. Now enter all the numbers from the old IC into the new IC and see if problem is solved. If not, I've forgotten which numbers are for the sound but since you copied the new IC's numbers you should have no problem when you read the service literature or someone here tells you what they are . Also pull the shield from the bottom of the tuner and resolder the grounds or expect to keep doing this. If you zapped the old IC then use the TV for target practice with a high powered rifle, I suggest .308 with a soft-point :-). Just kidding, you should probably get it professionally aligned. Unless you are willing to purchase the equipment needed to perform the tuner alignment and preserve your sanity or some kind repair shop owner who lurks here will accept the chassis you send them for repair. This may also apply with minor changes (e.g., part numbers) to other CTC chassis. With the back off, plug the TV in. Do you hear a chirp as the power supply comes up? If yes, check for +5 V at pin 8 of EEPROM U3201, if it is there, the power supply is working at least in standby. If not, remove the small 1.5 Mohm 1/4 watt resistor (I think it is R4104) and measure it. It is very common to be open, and you won't hear the power supply chirp. If power supply passes #1, remove the top shield off the tuner and run a jumper clip from the tuner ground shield and the vertical output heatsink, at the front of the circuit board. Plug the TV in and press power button. If the TV turns on, you will have to rebuild all the ground connections inside the tuner and run a couple of extra jumpers. Be very careful when removing the bottom tuner shield as there are many small surface mount components that are easily damaged. DO NOT place a screwdriver under the shield and pry up on it. Use a good soldering iron with a small high temp tip and resolder the inner ground posts preferably with the solder Thomson supplies, or use a good quality Silver Solder. Resolder all the outside grounds and add an extra jumper from the top tuner ground to E116 jumper at the bottom tuner ground. TV fails #2 test. Place a scope on pin 5 or pin 6 of the EEPROM U3201 and plug the TV in. You should see data for an instant then it will go away. If data is there all the time, the EEPROM is corrupted and the TV will need to go in for service as you will need several signal generators to realign the TV's chassis values and a calibrated cable signal generator to realign the tuner stored values. Should be around $90 for the repair. (However, see the section: Getting into Programming Mode on dead set and others dealing with tuner alignment. --- sam). TV is going into shutdown due to corrupted EEPROM data. See above. HV stays up but no video. Turn the screen drive on the back of the flyback up (bottom control). What do you see? - Retrace lines and a blank raster? Bad eeprom from #1 cause, above. - White line across the screen? Shorted CR4704 and 2 open resistors. Proper resetting of screen control on flyback Once the TV is fixed: Turn TV on to a video input with no signal. Turn the control up until you see the retrace lines, turn it back until the lines go away and you just see the raster scan lines. Where the set does not come on at all or shuts down immediately, the following MAY get you going. WARNING: If the shutdown is actually being caused by excessive HV, this could result in a dangerous and/or destructive situation! On the "T" Chip solder a temporary jumper from terminal 26 to ground this will bypass the HV shutdown circuitry. You should be able to fire the set up and enter into the program mode. When finished be sure to remove the jumper. This procedure has worked many times for me. Oh Ya!! don't forget to resolder the tuner section first. Setting the horizontal frequency to low (by accident or from corrupted EEPROM) may cause the TV to shutdown or give the with the appearance of being dead. To fix this is you need to check the value of the main 'critical safety capacitor' a.k.a 'redundant capacitor' a.k.a 'tuning capacitor' This is a larger blue capacitor that is connected from the collector of the horizontal output, it can be connected to ground in smaller sets or is run through the pincushion circuit to ground. Once you have the RCA part number order one, solder this in parallel to the existing capacitor and the set will fire up and not activate the high voltage shutdown circuit. You can enter the factory setup, reset the horizontal frequency for a stable picture, turn the set off and remove this added capacitor. I've used this sporadically only to be able to copy down all the other values in an EEPROM since if this happens on it's own it's a good idea to replace the EEPROM. This is not needed if you have the RCA signal generator for these newer chassis. Don't let the set run too long with the shunt capacitor either! This does work however, and is even the suggested method by RCA itself! After a number of these badly machined chassis, I have learned to count the service menu items in the event this very symptom crosses my bench. (once the resoldering has been accomplished, there is no need to replace the eeprom!) ; Clip shunt cap to horizontal output, turn set on (full AC), enter service mode, press Volume Up 76 times, Channel Up once, you are now in the horiz oscillator adjustment parameter. Volume up/down will adjust the oscillator to near sync. As soon as you see two or three slanted sync bars shut the set down, remove the shunt capacitor and try the set again. Isn't this fun?! Before you change the EEPROM, try using a Variac starting at about 40V AC. You may be able to get the set to come on enough to reset the register. If you change the EEPROM, your tuner setup may not be right anymore. "This RCA CTC175 came in with dead set diagnosis, as usual the problems was the EEPROM. I installed a new one and the set came on, but the new EEPROM came with the parameters set at default, and in some channels I had poor reception. When I get into the service mode I can adjust this parameters (100 and further) of the electronic tuner and I achieved a good reception changing this parameters. The problem is that, as far as I know, the way to save these parameters is pressing power, but when I restarted the set, got poor reception again. When I checked the parameters, the new data was there, at least in the display, but it has no effect in the reception. I think the procedure to save this parameters is not the correct." The correct procedure for aligning the tuner parameters is with a special piece of gear that you can purchase from RCA called a 'TAG001' generator. According to the manual once you adjust any of the tuning parameters you must align all. It is true, I've tried to "tweak" them in myself and you think it looks clear but when you turn the unit off or change the channel it is snowy again. I really suggest you check with RCA or a distributor and do it right. Pressing the power button is how you write your settings to memory. You are saving the parameters correctly. I have noticed on the CTC175 chassis that the settings for several of the parameters above 100 can affect the reception of the different bands in the tuner. 2 through 6 or 7 through 13 etc. can become snowy and clear as you adjust. If you don't have the RCA Tuner Alignment Generator (TAG) you just have to fudge until you get all the tuning bands acceptable. This is very time consuming and frustrating. Tuning voltages for channels: 2,6,14,17,18,13,34,37,48,50,51,57,63,76,83,93, 110,117, and 125 are stored in the EEPROM. Primary, secondary and single tuned. Three values per channel. Every chassis is different because of individual variations in manufacture, coil knifing, etc. So the factory default middle values are no good for any particular set. You may try to copy the data from the old EEPROM from 0x54 through 0x8C into the new one. If that doesn't help, you really have to realign the set. If you have the factory ATE rig it's less than 4 minutes. If you have the service rig (TAG001 or similar), it can be half an hour or more. The procedure is described in the service manual. You need a VHF/UHF signal generator at least; a spectrum analyzer is also very handy but not essential. You also need a lot of patience if you're doing it by hand and not software. The correct service information for the chassis involved. A signal generator capable of generating a signal on all cable channels. While items 1 and 3 are either inexpensive or common, the signal generator is neither! For any problems you might have, I recommend that you find a factory authorized service center for the brand you want repaired. There are several reasons for this suggestion. The primary reason is that only a factory authorized service center has the service manual, technical support and access to original specification parts that should make the service of your product effective. In addition, only a factory authorized service center will have knowledge of common problems which may occur in your model and may have suggestions from the manufacturer as to the best solution for those problems. Call the manufacturer to locate your nearest FACTORY AUTHORIZED SERVICE CENTER, or check your local Yellow Pages. Then call ahead to confirm that the service center is authorized not only for the brand of product you need serviced but for the specific type of product (for example, a Sharp FACTORY AUTHORIZED SERVICE CENTER may not repair Sharp CD players). If your product is less than 2 years old and you have concerns regarding early product failure, product quality, or repair problems, then you should direct those concerns to the manufacturer. Many manufacturers are eager to assist you if you take the time to call or write. If you do contact the manufacturer, it is important to have ready the model number, serial number and purchase date of your product. Many times they cannot assist you without that information. If you need to have a product repaired within the terms of the manufacturers warranty and you do not have your bill of sale (proof of purchase) then all is not lost! Most companies are prepared to send you a PROOF OF PURCHASE DOCUMENT if you call them with the model number, serial number and what you feel is the purchase date. This can take some time to obtain. If the FACTORY AUTHORIZED SERVICE CENTER you'll use has a fax number - ask the manufacturer to fax the letter to the service center. This will speed the repair along. Alignment is a must for proper operation. You will need a service manual for the instructions which should be available from your RCA distributor. You will also need a RF signal generator capable of generating the entire tuning range on the set (up through cable channels 120+). RCA sells one under the part number TAG-001 for about $200. There are about 150 parameter that will need to be aligned. With a lot of practice I have gotten the time down to about 45 minutes but the first ones became afternoon projects. Unless you plan on doing a lot of them you may be better off cutting your losses and referring the job to a shop with the needed equipment and experience. The problem with just copying data from the old EEPROM is that you run the risk of copying corrupted data. By the time a set fails to turn on due to EEPROM corruption the problem has existed for quite some time and corruption is usually widespread and a complete realignment should be done for peak performance. You are definitely not completing the repair properly unless you perform the eeprom chassis alignment per Thomson's specifications. Thomson sells a relatively inexpensive TAG generator that can generate all cable channels up to 125 and IF output. They calibrate it before they send them out. It also is crystal controlled, so it does not drift much over time, at least ours hasn't in five years of use. You cannot use cable as : 1. most cable systems don't send out 125 channels and 2. Cable systems are never 100% on correct frequency. Since we do over 2000 Thomson sets a year, it takes generally less than 45 minutes to troubleshoot, repair, and realign the CTC177 series of sets, all done to Thomson's specifications. It is extremely important to use the special solder and add the jumpers where appropriate per Thomson's solder kit. Back in 1995 a local hotel was having continual failures of the CTC176 chassis sets in over 200 rooms. Thomson paid us to go in and resolder all of the tuner grounds, spring of 1995, the sets were approximately 1.5 years old. We are now in 1998 and these same sets are starting to fail again. Thomson says it is due to the difference in expansion and contraction due to temperature of the metal shield and the solder. The special solder takes quite a high level of good soldering technique and a precisely controlled soldering iron. Once it sets up it stays slightly flexible, and the jumpers bypass the external grounds that cause the most problems should they fail again. One special note: the short internal jumper changes the tuners parameters and causes the set to need an eeprom tuner alignment for proper operation. Except for the fact the we only have UHF over the air broadcasts here, we would have not had anyone complain but channel 15 looks really bad unless the tuner is properly aligned. The newest Thomson sets do require the use of a computer interface to perform many adjustment operations. As well as turning the speakers back on after the set detects mare than 3 dc shorts at the rear speaker terminals. I don't suppose you have a Thomson manual for the set, but they have a tuner troubleshooting flowchart and voltage chart in the manual. If the tuner checks out OK, it may simply need a tuner alignment. That requires a Tuner Alignment Generator (TAG) and DMM. It's done through the service menu. Don't move the coils or anything like that. If the EEPROM was corrupted due to the tuner ground problem, it could have messed up the parameter 100-156 tuner alignments. More likely you have a component failure or solder bridge in the tuner section. If you're serious about fixing the set or expect to see more Thomson sets, you'd be smart to buy their service manual, as well as the CTC175/176/177 Training Manual and CTC177/187 troubleshooting Guide. "There are some secret codes on this GE TV. I had a Circuit City guy here before, and he held down the power-key or something & fiddled with the other keys during startup. Its almost like a computer's BIOS... Wild! Is this list available to mere mortals?" The following is the setup procedure for the Thomson CTC 175/176/177 chassis. Press and hold Menu button, press Power, then Vol+. Two displays appear at the right and left of center. Use the Vol+ button to step the right display to # V76 (Group 1 setup V76). Press Ch+ or CH- button to access parameter. Press Vol+ or Vol- buttons to change software value. To access the second level of the service menu, first press and hold MENU. Then tap the POWER and then the VOLUME UP buttons. You should see 4 zeros. Press VOLUME UP until the right zeros read '76'. You are now in the first level. Now press CHANNEL UP until you get to 13. Now press VOLUME UP again to '77' on the right zeros. You are now in the second level. Thomson has a CTC 175/176/177 Technical Training Manual which has all this information. Get a copy! If this set has the RCA CTC195/197 chassis you will need a lap top computer and the RCA chipper check software to adjust the digital convergence beyond the 25 steps in the set up menu. RCA is forcing the software on us in this chassis and any beyond it. I have run into at least 6 sets of the CTC177 family with bad channel up/down switches. One switch would get 'leaky'...stick on I guess. Everybody that I talk to has not seen this except fer me. A CTC177 came into my shop, Mfg'd Feb95. Customer said set worked fine, then channel could advance, but not lower. After a month of this annoyance, additional problems made viewing untenable: raster was snowing with horiz. scan lines etc., that made even OSD unviewable albeit perfect sound. Moreover, at this juncture, the set failed to respond to concomittant remote commands. I turned on the set - the customer was correct. I recycled the various Front Panel buttons. Then the picture was clear and normal, albeit saturation was high (too much color). I accessed the menu setup, but the color would increase and not amenable to reduction. I attempted to access other menu items, again failure. Careful feel of audable button action led me to believe two buttons failed. It required replacement of SW4101 and SW4311 (Channel Down and Volume Down). I am awaiting arrival of replacements. I've had two RCA (Thomson) Chassis with intermittent vertical problems. The fix was to install jumpers to carry the ground through all points on the PCB. The interesting thing in troubleshooting this intermittent (prior to learning the cause) was that you would typically resolder what you thought was suspicious solder connections (grounds and components to the PCB). Now to the point. One of the sets I worked on lost sound AFTER the repair. I found out that if the set didn't have an 'Internal speaker off' option, one connection on the sound module was not soldered at the factory. I soldered it when I was re-soldering connections and I lost sound! If you have the schematic, I think its Pin 3 on the TDA7263 Sound Module which is not connected at the factory on sets that do not have the internal speaker off feature. Very Interesting! Another way to re-enable the sound would be to lift R1915 (you can cut it on the top of the chassis) from the collector of Q1903 (Transistor is always turned on for the case mentioned above). "The raster is full height and is centered, but narrow at the top (less than half the width of the screen) and nearly full width at the bottom. The image is extremely distorted with gross convergence error at the sides. All waveforms associated with the horizontal output, vertical output and high voltage transformer (T4401) appear as depicted on the service notes." My first thought was mechanical - the yoke is grossly tilted on the neck of the tube - the TV was dropped or something. This would result in both trapezoidal distortion and convergence problems (probably purity as well). Another possibility is that a portion of the horizontal yoke windings (the upper half, in this case) have opened due to bad connections or a break in the wire. This would mean that the R, G, B electron beams would see less deflection at the top than the bottom and could conceivably result in the severe convergence problems as well. A short between H and V windings of the yoke is not a likely cause as this would result in much more severe (if that is possible) problems (including much smoke). I do not know whether EEPROM problems could result in this but considering that so much is controlled digitally these days, I would not discount it as a possibility. Width and Height are digitally controlled so that some peculiar failure in an LSI chip or the EEPROM might be possible. First, eliminate the more likely possibilities unless you have an EEPROM to swap and quickly confirm. The November issue of Electronic Servicing reviews the 175 and the 177. It appears that the EEPROM in these sets can cause a great deal of weird problems. It goes into great detail and gives some circuit diagrams of these sets. "I live in New Haven, CT and my local RCA/GE repair center tells me that a repair for this problem will cost about 145$??? Everyone who has responded to this post says under $100. Am I being taken to the cleaners?????????? That would really piss me off." We are an RCA/GE factory authorized service center. (You should have this work done by an authorized service center because we are the ONLY people who understand where all the problems are with this TV!) Our rate for this job is $77.00. Furthermore, if the TV is less than 2 years old it would be a good idea for you to call RCA/GE (same company). Call consumer affairs at 1-317-587-4151. Explain how you feel about the cost of repair and the set not being very old. The numbers of posts in this group referring to this problem confirms that there is a PROBLEM. Ask them to reimburse you for part of the cost. RCA/GE/Thomson is a good company and has always been willing to address complaints from consumers. I understand it is a different Tin/Lead formulation with Gallium added to both lower the melting point and make it more flexible after it hardens. With regards the melting point, as people have pointed out here, you have to get it up to at least 800 degrees to make it flow properly. Well, yes and no. I get the best results With a Weller PTC station and a PTE8 (800 degree screwdriver tip), which I think is the biggest physical size tip made for that iron. That's the clue... use a big tip and solder quickly. Use the edge of the tip for the areas close to SMDs. The large mass heats the metal quickly so you don't have to cook the board. I've done hundreds of these sets and since the first few when we didn't know about all the 43-46 (depending on how you count) joints, have NEVER had one come back and NEVER expect to see one back. If one ever does come back, I'll fix it for free! Guaranteed! I've had a few from other shops and from refurbish shops that were not properly soldered. But, if done right with 60-40, they will not come back! We have been soldering grounds containing various mixes of metals ever since the PC boards first came out. Soldering grounds is nothing new. The same requirements hold now as always did. Flux + Clean joint + proper heat will make a good joint! Every time! Of the ones that I've seen lately that have come from the refurb shops, the same problem exist. They didn't heat the NEW solder to the flow temp and it still didn't make a good joint. Even with the NEW solder, they still can't get it right. Is it a waste of resources? YES! Why would it work? It is a gimmick to make the tech heat the ground connection to the proper temp to make the solder bond to the ground. It requires a higher temp to flow the NEW solder. In the process, the temp of the ground metal is heated enough to accept the bond. Why would TCE recommend the new solder? It's called CYA (Cover Your A**). There's got to be an excuse for their continuing to sell so many of the units with a manufacturing defect. This is an excuse because they can't figure out how to fix the problem on the assembly line without spending mega bucks. Do I care? No it makes me mega bucks. What causes the problem in the manufacturing plant? The solder bath does not heat the grounds to the proper temp. Why don't they just put the new solder in the solder bath? Because the temp required to flow the new solder would peal the board. Why don't they just heat the solder bath hot enough to make the grounds bond with the solder? Because a temp that high would peal the board. Why do they do it this way? Because it is a cheap process. Is there any need to use the new solder? NO, just heat the grounds until the solder flows. Will the joint hold if 60-40 is used? YES, just as they have always held ever since we first started working with PC boards if solder is properly flowed, various metals notwithstanding. You are incorrect about the lack of heating of the tuner caused the poor solder to the tuner grounds. The problem was that the board and tuner had a different expansion rate, this caused the solder to tear apart over time. Since TCE used wave flow and pre-heated the entire unit before the solder was applied, the stress started as soon as it cooled down. If you re-solder, it will last longer but the same problem will come back in time. TCE changed the tuner shield material several time before finding the right match. The solder was a by-product of the tuner shield material, the new shield had a melting point that was close to the solder melting point. TCE was sued over this and is very tight lipped about this information. I was there, as a EE and a QA person. I watched the hole bloody mess develop. Call TCE at: 1-317-415-4370 and request that they fax you an order form for S-kits. The kits are free and if you do the rework the way that it is described, your customers will have a permanent fix. The advice being given to you by those who would just use regular solder is a temporary fix that will probably last about 5 years if your customers are lucky. Of course some tech's will delight in this thinking of repeat business... Others may have actually convinced themselves of this to justify the "easy money". Some will pretend that they know better because they are old timers. I've been working in the electronics industry for over 25 years. I consider this long enough to know whereof I speak. In any event I'm sure that if you use regular solder you won't have any comebacks for probably about three to five years. And if you do it the way TCE says you might have problems there too because they have not covered all the grounds that should be jumpered with their rework instructions. I have used the computer to show only the the ground traces so that it is easy to see the ground scheme around the tuner. I have a modified jumper scheme that grounds a couple of points that aren't covered in the TCE instructions. I have not had any comebacks using my improved rework instructions, and have the satisfaction of knowing that my customers are getting the best service possible. I'm tired of watching the mindless babblings of debate concerning this subject. Right On, Dave. Regular solder doesn't get it. I've been doing warranty work for Thomson since before the CTC17x & CTC18x chassis with the tuner problems came out. Have done several hundred tuner repairs on these sets. The original technical bulletin issued by Thomson for this problem, TV 94-006 (5 August 94), instructed the tech to inspect and resolder tuner ground connections as necessary. Nothing more. Less than a month later, they issued an enhanced procedure for doing the same old resolder job. The resoldering wasn't holding up, so in February 96, they issued TV 96-005, giving the current procedure with special solder and jumpers. I have seen about a dozen sets come in that had obviously been resoldered somewhere else, and the connections had cracked again. I had one of my own customer's sets come back in less than two years after I had resoldered the tuner grounds with plain solder per the first bulletins. I know all of you who have been slapping tin/lead on the tuners don't want to hear that it doesn't hold up, but that's the facts, jack! If you haven't seen any of those sets you've soldered come back, it's probably because those particular customers don't trust you anymore and took their sets somewhere else. Maybe out to the dumpster. Use the special solder PERIOD. We have properly resoldered thousands of these ground connections, over one thousand before Thomson came out with the solder kit. Many of those are now coming back with cracked solder connections 3 years later. Actually, looking at only the 3 motels that were resoldered in early 1995, approximately 15% of them have failed since the start of this year. Once we got use to having the soldering iron at the exact proper temperature, the repairs only take a few extra minutes. The engineers when they first designed the sets overlooked the fact that they were working with 3 different kinds of metals with different heat-cold expansion rates, this is why even when soldered properly they can and do break again. The "special" solder is of a material that stays somewhat pliable after it sets up, allowing for sufficient expansion so the solder connections will then outlast the expected 5 years of the picture tube. The new sets do not have nearly the failure of the old ones in the tuner grounds. Why? they have changed the solder formulation, the metals used in the shield and added traces to bypass the failure of the connections. They also greatly reduced the size of the holes the can gets inserted into. Prior to Thomson bringing out the s-kit, we were adding 3 extra jumpers in the most critical failure points and using a silver based solder. This was our best attempt to provide the customer with the best possible repair. Materials used per manufactured item. Frosting a beer mug and vapor soldering a circuit board are similar. Higher temperatures (more power consumed), longer deposition times (more time to fabricate) and more solder (more materials) produce solder more like hard ice on a mug rather than frost. "Frosty" solder is softer and will fail from thermal cycling or mechanical stress much more easily. Factory quality control departments try to minimize in-warranty failures (mean time between failure) just to the point where it balances the (1), (2), and (3), minimums, above. The special solder supplied in the kit is *not* a rosin-core solder. Paste flux must be used to get the solder to flow. The solder included in the kit remains elastic when cool to prevent joints from breaking due to thermal expansion. There. Now, you know everything I know! "I guess that's good news for the RCA/GE group (Thomson), but, unfortunately it took them over 2 years to correct the problem. They should have had a factory recall on these tv's and made their customers happy or at least "happier" than they are now! Instead, I have found, they won't even honor their extended warranty in several cases. I just fixed one of these tvs for a lady that had exactly that problem. Her extended warranty is good to January 1988. She called Thomson when she started having problems with the tv. They gave her a list of about 3 or 4 "authorized service centers" for the RCA/GE tvs. She spent the better part of 2 hours on long distance calls and to her surprise, they would not honor the warranty as stated. The warranty states that they will provide IN HOME service for any tv that is 19" or larger. She has a 20" tv and when she called the closest warranty center, they told her they did not travel that far for repairs. The distance was approximately 75 miles for the closest "service center" that they referred her to. She got the same answer from the other places they offered . They said they would fix it if she brought it in, but, this lady is elderly and obviously her mother is older. She got this tv for her mother, with the extended warranty, so she could eliminate the problem of having to haul it somewhere if she had a problem." Typically, these days, the customer is expected to bring in sets of that size. However, if in home service was a condition of the warranty, then it seems to me a service call should have been made. Look closely at the warranty, however, and see if there's some fine print that allowed them to get out of making such a distant service call. Remember, these documents are written by lawyers! "Her reasoning was that it was a GE and they are a "GOOD TV""
"We bring good things to life"! Fooled *her*! In my opinion, those sets are crap. For that matter, what about "RCA"? For years, they were a better color TV than GE. How many consumers really know that today, RCA = GE? Don't own one, don't want one. But how does the average would-be purchaser know this? I noticed these things beginning to come in, with the same type of problems, about a year ago. Not till I began reading this group did I realize how common the RCA/GE failure is. I don't think a week goes by without somebody posting about the CTC175/177. In fact, I've saved several of the posts on the subject. Now, if a customer stops by with one, and expresses disgust at the set's needing repair at such an early date, I just bring them over to the computer and let them read a few of these posts. The one that sticks in my mind was made last spring. Somebody posted of an odd problem they'd been having with a late model RCA or GE, and whoever replied said something like, "Oh, you must have a CTC 175/177. Hehehehehe!" "And the company would back up any claim they gave in writing! Right?? WRONG!! She was so disgusted after she attempted to get them to repair it that she called me back and said to come and pick it up, fix it, and she would just pay for it. She was not messing around any more with them. So, on top of buying the tv and paying for the extended warranty, she now has an additional charge for my repair bill. I'm sure she won't be purchasing another Thomson product.. ever!! This tv was purchased brand new in January 1995." Barely more than a year old. Unfortunately, that's fairly typical for the RCA/GE with that problem. In fact, I have to go look at one today, same problem description, about the same age; a 27" floor model. "I'm also sure she is not the only customer who has experienced these similar problems. Don't get me wrong, I don't think this mishap will put a company the size of Thomson out of business or anything close to that, but, I'm sure it hasn't helped their public image at all." "I know they sold a ton of these sets that will still need repairs in the future too!" Yeah, we'll have work for some time to come. "I just think their announcement is just too little, too late. I'm sorry for rambling on, but, some of these companies and their greed just get me a little pissed off." Thomson Consumer Electronics has been good about taking care of this problem, despite the TV's being out of the warranty period, in my case, anyway. There is a 1-800 number to call Thomson Consumer Electronics about this problem. My 2 year old 31" GE TV had the same problem. I called, they sent an acknowledgement letter, I had the set repaired (~$90), I sent a copy of the repair bill along with the letter back to Thomson, and they reimbursed me the full cost of the repair. I don't have the number with me right now, but if you can't locate it elsewhere, I will dig it up at home. I had it repaired in late May and the reimbursement check came last week. You will also need to send them a copy of the original sales receipt for the TV. Good luck. I like many others have faced the solder problem. I bought my 27" RCA, Model F273S1WN, television on January 9, 1995, and paid for a two year extended warranty. With the extended warranty, my labor was covered until April 9, 1997. I first experienced video and sound problems in August 1996 while the television was still on warranty. I had almost the identical symptoms as stated in section 1.2 of you article. I brought the set in for repair and was immediately informed that I needed a part to repair the problem. After three weeks, I got my television back, and it worked fine until April 17, 1997 (eight days after the warranty expired). I again brought the set to the same repair company. This time I was told that all the solder connections had to be resoldered at a cost of $115.00. Since my television had the same symptoms as it had the first time it went bad, I asked if they just fixed the same problem again. The repair company could not find any paperwork of the previous repair so I called the warranty company and they stated to me the the repair done in August 1996, and the problem was soldering not a part replacement. I called RCA at (317) 415-4151 and stated that I felt I should not have to pay for repairs even though my warranty had expired. They agreed to reimburse me for $85.00 of the cost of the repair. If you have to, there is a 900 number supplied by Thomson. Yes it is $2.50 a minute, but if you can clear customer for the bill at least the set is fixed and you get the money. They have been pretty helpful when I have had to use them on a dog unit. Since these are manufacturing problems and not electronic design faults, the long term reliability of these RCA/GE chassis with properly repaired solder connections should be excellent. "How far to the landfill? I expect these TVs to be problems for years to come. Cut your losses now!" My experience with these sets has been that once the grounds are repaired they are quite trouble free. I would much rather have a set with one or two easily repaired faults than one with different faults everywhere like the Zenith System series. For what its worth. We are an authorized TCE service center in the central CT area. TCE has been giving customers special authorization. Letters for tuner-skit repairs in the amount of $75.00 for carry in, and an extra $20 for in-home on 31" and larger sets. The customer is expected to pay the difference. So far if the s-kit instructions are followed, we have only had one or two repeat failures out of at least 500 repairs done to specs. in the TCE bulletin. Many authorized servicers in this area seem to think the jumpers and special are just BS. I can't say for sure but TCE's procedure seems to work. If you scrap it, donate it to a repair shop. Despite this chassis' notoriety, once PROPERLY repaired and updated, it will outlast pretty much any other TV under $400. We sell these reconditioned with a two year parts and labor carry in warranty, and see less of these come back percent-wise than the new TVs we sell, regardless of brand. Tossing useful products in the landfill doesn't make a lot of sense. I would buy an RCA/GE TV. The problems with the solder connections have been solved on the newer chassis. Once the connections have been fixed on the problem sets there is no other common problem. If you yell at RCA they have have been paying for the repair. I would, the problem with the solder connections has been fixed in the newer chassis. Once the connections have been fixed on the problem sets there is no other common problem. If you yell at RCA they've have been paying for the repair. My experience with these sets is that once the grounds are repaired they are quite trouble free. I would much rather have a set with one or two easily repaired faults than one with different faults everywhere like the Zenith System series. I live in Mass. and have sold and repaired hundreds of the ctc175/6/7 chassis. If a technician is called when these problems are first noticed I would call it a minor repair. If the repair is done properly, it WON'T happen again. The most you should be charged for this repair (no parts changed) is around $70.00. I have never had to do a second repair on the same set. I do not recommend anyone without experience touch these chassis. You can mess up the tuner very badly if you touch the soldering iron to one of the many surface mounted components. Pay the $70 and have it done right. I even let people watch me fix this problem to show them what it was. What you have to realize is RCA has made a terrific set with a minor bug. These chassis, in my mind, are the best on the market once they have been repaired. The new chassis they produce now ctc189 is a great improvement. Basically the same design with no bugs. I have sold many of these sets and have had not one return! I haven't confirmed this so I don't know if getting reimbursement will be possible after the close of 1998. I also understand there may be a class action lawsuit brought against TCE so we may not have heard the last of it in any case! On 1/1/99 TCE will discontinue issuing concessions to help cover the costs of the tuner jobs (S/B 96-005). Up to this point TCE would cover $65 of the labor and all of the parts for any of the chassis: CTC175, 176, 177, 185, 186, 187 - units that met the serial number group mentioned in the service bulletin. Their feelings are that all of the units in that S/N range that are going to fail, have done so already. They will also discontinue the special commercial program design to assist motel and other institutional users with this modification as well. "Just got off the phone with Thomson. I was "authorized" to receive $75 for the repair, plus $20 for travel to my house. My local repair shop quoted $110, if I brought it to them. So if I can't talk them down much, I may tackle the repair myself. I'm a EE, which isn't saying much, but I work with many talented techs who can help get the job done." The same thing happened to my GE 25" TV. I was told it is a problem with bad solder near the tuner. This problem is very prevalent and GE (Thomson Electronics rather) is aware of it. My TV was out of warranty too, but when I called GE at 317-415-4151 and complained about it, they offered to assist me in taking care of the problem. They paid $75 in labor and all parts charges. They even set me up with an authorized service center locally and paid them directly. I did not even have to get anything reimbursed. I had to pay $90.00 for labor ($15.00 out of my pocket), and the unit now works fine. Even though the quality of GE TV was bad (this solder problem), I laud their customer service. I hope you could get taken care of in a similar way. If you call that # and find that you get nowhere, call it back another day and talk to a different person and you will probably get satisfactory results. I've told this to many customers that didn't get results on the first call and they had success on the next call. We just had our 3 year old GE TV serviced for a problem with the tuner shielding. The tech had to resolder the shield. Even though our warranty just ran out, it was honored. The tech said this was a common problem with GE & RCA - the board heating up and cracking the solder joints. He also touched up a couple of other areas in the vicinity as 'preventive maintenance', he said. It's back to working fine now. Thomson Consumer Electronics' US headquarters is in Indianapolis, IN. I have found them relatively accommodating if a product is 1 or 2 years old. Any older an they tend to take a harder line (which is not unreasonable). Many other manufacturers have "silent recalls" for products that develop problems in a significant percentage of the same model. These will usually last for 6 months to a year and service centers are reimbursed for the repair as if under normal warranty. Two examples are Gold Star with the infamous reel sensor failure and Sharp with Hi-Fi audio crackling. Both of these were covered for one year. "I am trying to decide if I should attempt to repair this myself or take it to the shop. While I have am a degreed EE (who actually has his own lab bench), this only serves to remind me of how much I actually don't know about TV repair. From reading the above information, it seems that there are no component leads that need resoldering, only the shield connections. Is my perception accurate? Are all of these spots easy to access? Is the template in the repair kit helpful/accurate? Can a do-it-yourselfer get the template? Is it really necessary to use the "elastic" solder? (Got to admit - I've never seen elastic solder - wonder if that's a marketing ploy to try and convince you that you'll never have to repair cracked joints three years from now. If your are skilled in soldering you may be able to do it yourself. Be advised that the traces and components under the shield are fairly small and subject to damage and detuning. The template provided is accurate. As to the reliability of the repair only time will tell. I have had no reoccurrances on the units serviced with standard solder 3 years ago before the "elastic" solder kit and jumper wire instruction set was made available. "Because of the above uncertainties, I would prefer to have a professional do the repair. However, I want Thomson/GE to pay for it. It appears as though there is an obvious design/manufacturing flaw. My company would recall/repair its product if this happened. So I feel Thomson/GE should also. It's the principle of the situation. But, from this web page, it seems as only RCA is reimbursing their customers for the repair, not GE. Does anybody know a phone number where I can call and complain to Thomson/GE? Has anybody heard of any successes in getting GE to pay for it? Does it have to be a GE authorized repair center? Any help is appreciated." Good luck. Thomson Consumer Electronics the parent company of RCA and GE televisions has been quite difficult to deal with regarding this problem. I have had them tell customers that I did not know what I was talking about and denying that a problem exists. This after sending out 3 service bulletins on the problem. I even received a letter and phone call from the field service manager stating that such information was not to be released to the general public. The phone number I have for TCE customer relations is 1-317-415-4151. Be prepared for busy signals and a wait on hold. Officially the work is to be done by an authorized service center but I have heard of cases of reimbursement for work done by non authorized servicers, generally in rural areas where an authorized servicer is not locally available. I would suggest having the work done by an authorized servicer since they should have the needed solder, training, and experience. The good news is that these sets have been very reliable otherwise. I have an RCA 27" TV with a CTC 177 chassis. This set was manufactured in June 93, and I purchased it in September of 93. A couple of months ago, I started experiencing problems with the set, i.e: snowy picture, picture compressed, picking up other channels. Typical problems associated with CTC175/176/177 chassis. I telephoned several repair shops. Each one of them was very familiar with the problem. I took it to one shop in the area. He charged $115 for the repair. $85 for the solder problem and $30 for additional EEPROM configurations. Based on estimates I seen, this seemed like a fair price. My repair man gave me the telephone number of Thomson Consumer Electronics, and asked that I request partial reimbursement for the repairs. This is where the fun begins. I first spoke with a customer service rep(Patrice) who would not give me her last name. She stated that she was not aware of any problems. I asked for the supervisor's name. After a brief conference with the supervisor, (I suppose), she gave me the name Ryan Brown. She also said because the set was older than 3 years, I was not entitled to any refund. She hung up before I could get further explanation. I telephoned back, and asked for Ryan Brown. Mr. Kevin Johnson answered my call. He very rudely said he was unaware of any problems despite what every repair person I spoke with and the hundreds of responses on the internet. While he did say he would not offer any type reimbursement, he was willing to offer a certificate towards the next RCA/GE/ProScan TV purchase. I told him, I will no longer be purchasing any brands manufactured by Thomson Consumer Electronics, because in my opinion, they do not stand behind their products. I will no longer purchase those brands, and I urge consumers not to purchase those products. I suspect that the reason towards my bitterness, is that I own two other Sony TV's, and a Mitsubishi, which are at least 12 years old, and they perform flawlessly. We had the misfortune of buying a 35" RCA TV in September 1995. We chose the RCA based on a Consumer Guide rating that indicated it to be a "best buy". We paid over $1200 for the television. Within 8 months, we were experiencing the "shrinking picture" problem. I believe the manufacturer's warranty was 90 days on labor and 1 year on parts. I called the authorized service dealers in our area as well as several others and learned that the estimate for the repair was typically more than $200. No repair shop was able to tell me that it was a known problem and that I should contact the manufacturer to see if they could offer any type of assistance. I went with a non-authorized dealer close to home who charged me $138 to fix the "vertical output system". Of that amount, $30 was for pick-up/delivery and the rest for labor. The TV worked fine after spending the $138. Well, less than two years later, the same problem is occurring again. It just so happened that last month's Consumer Report magazine (my subscription hasn't expired) indicated that Thomson Electronics recognized a defect with the TV's and suggested that the Customer Service number be called. So, after numerous long distance phone calls (the first time I was told I needed the exact date of purchase, since I couldn't recall if I bought it on 9/5/95 or 9/6/95, and to call back). I can't imagine that the one day made any difference, but I verified the date, called back and eventually got through. They said they do NOT admit to the televisions having a problem. However, since the TV is relatively new and I have already had one out of pocket expense, they would give me a "special warranty". They said that I am "lucky" to get this, since I had a non- authorized repairman look at it originally. They agreed to pay for all parts and up to $80 for labor, if I went to an authorized service center. They recommended Martha Lake Electronics. I called Martha Lake and learned they have a "flat rate minimum" charge for large TVs and won't even begin to look at the TV for less than $225 and it could go up from there! Pickup/delivery is another $110 at Martha Lake (which is about two miles from my house). So, I contacted the other authorized repair service and he said he could probably do it for $150 plus $40 for pickup/delivery. I called Thomson back to let them know that the amount they are authorizing doesn't even come close to covering the cost of the repair. They were unwilling to negotiate a different amount. They gave me the names of other authorized service centers in other cities within a 30 mile radius that I could call for comparison. They said they had mailed out my authorization on April 29, but I told them I never received it. They checked and for some reason it didn't get sent. After another long distance call of probably 20 minutes they said they would send another authorization today. Needless to say, I am thoroughly disgusted. I am mad at Consumer Reports for recommending a TV as a "best buy" which was built by a manufacturer that had a running history of a known defect. I am mad at the authorized service dealers who didn't mention the problem to me when I first called in June 1996 when I could have perhaps negotiated with Thomson Electronics to pay for at least part of the repair. I am mad at the repair service dealers who appear to be charging customers much more than they should for this repair (all other information in your article on the internet said that all the repair associated with this problem should easily be accomplished for $99 or less). They tell me it is a "major repair" to do the soldering. I am mad at Thomson Electronics for not authorizing full repair of my television, since it is a recognized problem (in your article, someone indicated they should even authorize a recall). The one thing I did learn is that I will never buy another RCA (or GE) product again and I will no longer use the Consumer Guide recommendations upon which to base my buying decisions. So maybe I made a one time purchasing mistake, but they have lost my business forever, which in the end, could be even costlier for them. Since I wrote the note, other problems are occurring with the television (we can't turn it off - other than unplugging it, and the picture is nearly obliterated now with "snow"). By the way, I got a letter from Thomson Electronics on Friday, May 8 (dated April 29), authorizing the repairs/labor (up to $80). I have All Area Servicing coming this morning to fix it (they said they should be able to do the repairs at our house). The "house call" is $54.95 and the repair will be another $100 plus tax. They say that once a complete soldering job is done that the TV's seem to work fine. I certainly hope so. I don't look forward to facing another $150 bill in another two years. Thanks for listening!